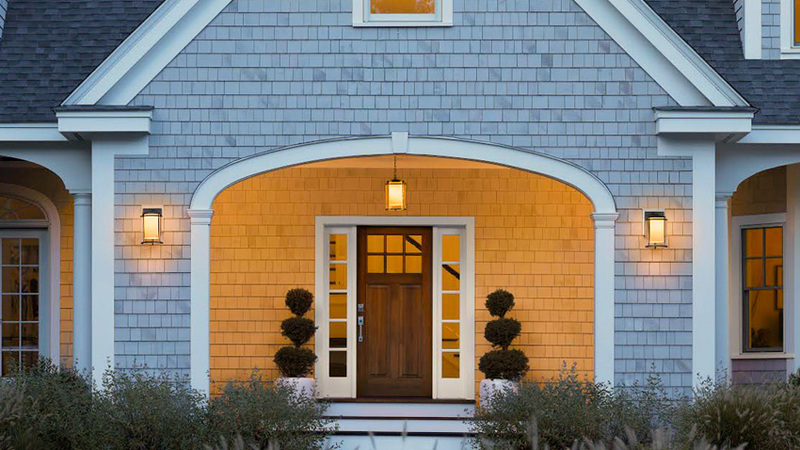 Q: What should I consider when selecting fixtures for the exterior of my house? A: The first step is determining the type of fixture, or fixtures, that best suit your house. This is, of course, a matter of personal taste. A flush-mount fixture works well on porches with low ceilings, while a pendant can be a good match for higher ceilings, depending on wind. Sconces on one or both sides of the door are a classic choice and can be combined with a ceiling fixture if you have a portico. If you have a tight space with no covering overhead, mount a single sconce near the door on the handle side. Whatever style you choose, invest in a quality material, such as copper, brass, or powder-coated forged steel. These metals come in multiple finishes and hold up well in Maine weather. Choosing exterior fixtures that are too small is a common mistake people make. Lanterns that look large in a crowded showroom often get lost on the broad façade of a house. And when you stand back 50 feet, they appear about half their size. As a general rule, select models that are roughly ¼ to ⅓ the overall height of the door. Before making a purchase, cut cardboard to the size and shape of the light and affix it to your house, then stand on the street and see how it looks. 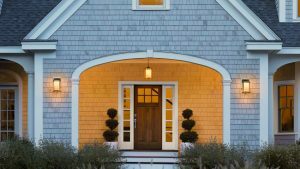 Lamppost fixtures should match those in the entry and be approximately the same size. Garage fixtures are usually a little smaller and can be a different style if they are not visible from the front of the house. Glare is another issue with a lot of exterior lights. A prime example is the motion-sensor flood lighting many people have on their garages. Instead of helping you see, these fixtures actually blind you! When it’s dark out, a little light goes a long way. One frosted, 40-watt-equivalent LED bulb per fixture is usually just right. To truly minimize glare, and light pollution in your community, opt for a “dark sky” fixture, which has a shade that shields the bulb and directs the beam downward — your neighbors will thank you!